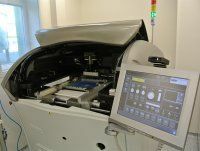 TESLA BLATNA runs thin and thick film technologies in clean rooms class ISO 7 and 8 according to ČSN ISO 14644-1. The pilot line is equipped with sputtering and evaporation machines, equipment for photolithography, laser trimming system, diamond saw for cutting alumina and silicon substrates, sophisticated screen printer, and other machines. The deposition process is standardly applied to sputtering metal films of gold, platinum, tantalum, nickel-chromium, titanium and tungsten on alumina, silicon and flexible substrates like Kapton. Standard alumina substrate dimensions are 4 inch by 4 inch (101.4 mm by 101.4 mm). Thin film structures are fabricated using standard photoresist mask, wet and dry chemical etching in special cases using lift-off procedure. Standardly attained line/gap widths: down to 0.2 mils (5 µm). The customer’s design is transferred into chromium masks that are used for photo-imaging process. The masks layout respects the process needs. The dispenser system is designed for precise deposition of conductive or dielectric pastes. It is used for wire contacts fixing, thickening contact pads, etc. 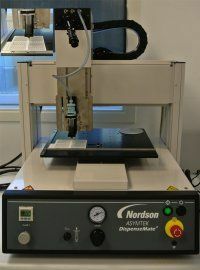 The sophisticated laser trimming system is used for testing and trimming thin film resistors and different thin film applications. The 3 W Q-switched YAG green laser beam using wave length of 532 nm evaporates readily thin metal film. 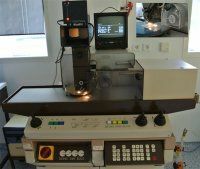 The laser beam can be focused very exactly to create cut exhibiting width down to 0.5 mil (12.5 µm). The system can trim resistors in the resistance range of 0.1 Ω to 1000 M Ω. The precision of trimming down to 0.02% depending on the resistance value. 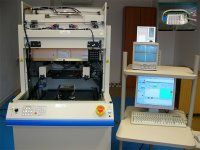 The printer is used for selective deposition of conductive, resistive and dielectric pastes on alumina, glass and flexible substrates. The resolution of the process enables line/gap width down to 50 μm or even better. The machine makes spot welds to attach wire leads of 0.2 to 0.3 mm diameter and 10 to 100 mm length to thin and thick film contact pads. The diamond dicing saw can cut alumina and silicon substrates up to the dimensions 4 inch by 4 inch. Electroplating nickel and gold, wet deposition processes, testing procedures.